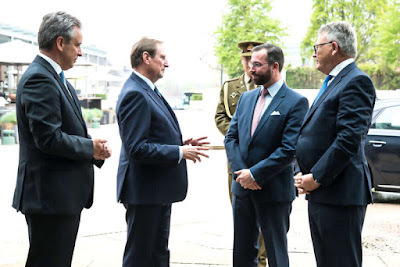 On Sunday (the 7th), Hereditary Grand Duke Guillaume was at the Grand Théâtre to hand out a number of diplomas, including those recognizing the honored Promotion du Travail, in addition to Diplômes de Maîtrise, and Certificats de Tuteur en Entreprise. The Hereditary Grand Duke gave a speech for the event as well. Also present for the ceremony were Claude Meisch, the Minister of National Education, Children and Youth, in addition to Minister for Higher Education and Research; Nicolas Schmit, the Minister of Labor, Employment and Social and Solidarity Economy; and Roland Kuhn, the President of the Chambre des Métiers. A few more photos available at the Cour website.